Many dental emergencies are inevitably caused by neglect. 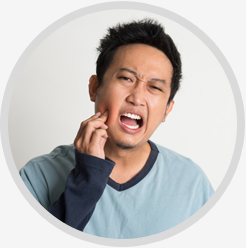 Many individuals wait until the pain from a tooth, and the anxiety resulting from it, becomes intolerable, which varies from patient to patient. The pain from a toothache, however, is not a life-threatening emergency requiring immediate extraction, but is often required for pain relief. Do I Need An Emergency Tooth Extraction? A life-threatening situation where a tooth would require an emergency extraction would be in the case of an abscessed tooth. The odontogenic infection and resulting sepsis has become systemic and may cause life-threatening swelling which affects the airway and spreads sepsis through facial spaces. Another life-threatening situation would be a hemorrhage after an accident, where teeth have been partially avulsed, and uncontrolled bleeding from remaining teeth roots is present. Another situation where an emergency tooth extraction would have to be performed would be prior to intubation through the oral cavity where mobile or grossly decayed dentition may break off. During intubation, it is possible for teeth fragments or entire teeth to be ingested or even aspirated, leading to potential serious complications. This is a situation where an urgent tooth extraction is required. The patient may have the option to salvage the abscessed tooth with endodontics. In some cases, emotional problems force the patient to undergo a tooth extraction instead of restorative treatment. Often analgesics cannot control the discomfort.